If you thought Zynga was done releasing items to celebrate Christmas in FarmVille, think again. 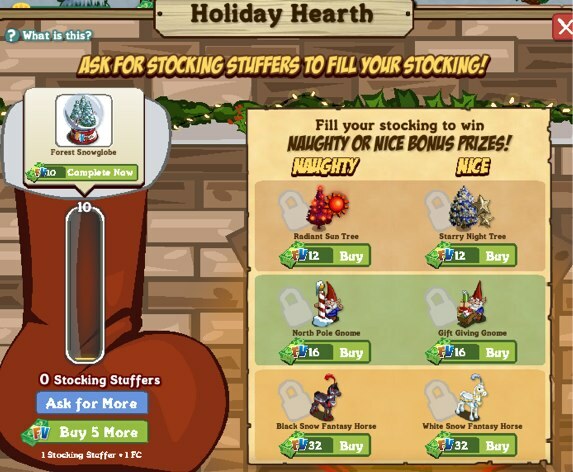 A new Holiday Hearth has rolled out to users' farms, allowing players to ask for Stocking Stuffers from friends. As you fill your stocking, you'll also be eligible to ask your friends whether they think you've been "naughty or nice" this year, and will have a chance at different items accordingly. First and foremost, you can place your Holiday Hearth on any farm. From there, you'll need to start collecting Stocking Stuffers from your friends (or by purchasing them with Farm Cash). This isn't just a one-time deal, but you will fill your first stocking at 10 Stocking Stuffers. This gives you a free Forest Snowglobe as a prize. At this point, you'll be able to access part two of this event, which asks you to start a poll amongst friends as to whether or not they think you've been Naughty or Nice. Depending on which way your friends vote, you'll be eligible for one of two prizes for free. For this first round of voting, the Naughty side will reward you with a Radiant Sun Tree, while the Nice side will give you a Starry Night Tree. You'll need just four votes to reach either extreme's prize, and you'll have two days to earn those votes (for one option or another) before these prizes apparently expire. Once you have finished earning enough votes for one item, you'll be given a discount on buying the other item, depending on how many votes you received for that one. I personally received all four votes for the Starry Night Tree fairly quickly, for instance, and was then left to pay Farm Cash for the Radiant Sun Tree. This works in a manner that you're allowed to receive more and more votes for this item, up until you just need one more vote. As of this writing, you aren't allowed to earn the other item for free, as the game won't register any last votes that would have given it to you for free (we tested this on multiple accounts). In the case of this Radiant Sun Tree, however, you can earn enough of a discount (by having three out of four Naughty votes) to take the price from 12 Farm Cash down to 3 Farm Cash. Through the rest of this event, we'll see four more items available via the Naughty and Nice polls: a North Pole Gnome and Black Snow Fantasy Horse for the Naughty side and a Gift Giving Gnome and White Snow Fantasy Horse for the nice side. While you may have a time limit to earning the four votes, if you finish before the time is up, you can immediately jump into the next stocking. For instance, the second stocking level requires 35 Stocking Stuffers in all and rewards you with a Holiday Carousel when you fill it. Just remember to keep checking back with your Holiday Hearth so that you don't miss your chance at these free goodies. Or, if you can't wait, feel free to purchase each item for (ever-increasing) amounts of Farm Cash. Happy holidays! 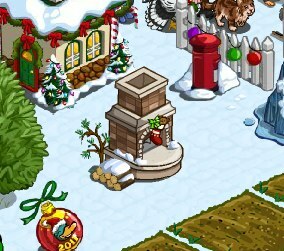 What do you think of this Holiday Hearth feature in FarmVille? Which set of prizes are you most looking forward to winning - Naughty or Nice? Sound off in the comments.